Will 2012 be a year of reckoning in the Middle East? On the April 16th edition of the radio program Prophecy Update, I was interviewed by Bill Salus, author of the popular Psalm 83-themed book Isralestine and evangelist on the end times website Prophecy Depot. Bill and I spent much of the interview discussing how social media has made a huge shift in how we do online evangelism. We also touched on the subject of whether 2012 will be a particularly prophetic year. 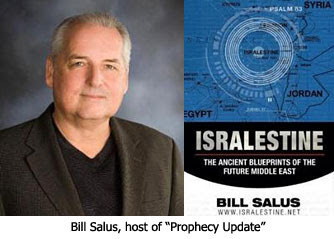 Bill Salus: What are you seeing with regard to Israel as an end times sign? Will 2012 be a year of reckoning in the Middle East? Nathan Jones: Concerning 2012 as being some kind of apocalyptic year, Tim LaHaye called our ministry this week and had something funny to say. He told us the Rapture will not happen in 2012. We were all like, "Really, why is that?" He responded, "It's because of those darn Mayans and their calendar! They predicted 2012, so the Rapture can't happen in 2012." He was laughing, of course. He was joking. Many people like Harold Camping and all these other false teachers continue to try and set the date of when the world will end. Many are not even talking about when Jesus will come, but skip to when the world will end. The Lord has made it very clear that He will come when people least expect it. He kind of compares Himself to a thief. The thief does not announce when he is coming. He sneaks in so nobody is ready for him. Just like that, the Lord says when He returns for His Church He will be sneaking in. Concerning world politics, especially as they concern what's going on in the Middle East, behind all of these world politics and pressures we must remember Ephesians 6:12 which reminds us, "Our struggle is not against flesh and blood, it is against the rulers, it's against the authorities, against the powers of this dark world. And against the spiritual forces of evil in the heavenly realms." Ephesians show us the true situation of what's going on behind the scenes. When we experience end times signs like natural disasters and wars and spiritual oppression and apostasy, it's because there is a war going on between God and Satan. Satan's forces appear at this time to be winning, but the Lord will only allow that until His return when He will eventually destroy all of His enemies. At the center of the battle between God and Satan stands Israel, and particularly Jerusalem, because God has made specific promises to Israel. At the end of the coming seven-year Tribulation which will devastate the whole world, a remnant of Israel will turn to Jesus as their Messiah and accept Him as Savior. The Lord has also promised that during the 1,000 year Millennial reign of Jesus here on earth, the believing Jews will become a special priesthood of people throughout the planet. Satan doesn't want these promises to happen. So, his plan at this time is to eradicate the Jewish people. Proof of this is that we are seeing right now a marked rise in anti-Semitism. We are seeing all the nations of the world including the United States turning against Israel with the hopes of one day annihilating it, all for satanic reasons. Satan hopes by eradicating the Jew that he will thwart God's plan. Well, we know that no one can thwart God's plan. Eventually Satan will lose, even if right now we are in that peak of world events where it looks like he is really starting to win. Bill Salus: It appears as though some of these prophetic wars that have been spoken about in the Bible could come forth very soon. Nathan Jones: Could some of these prophetic wars of the Middle East against Israel like Psalm 83 and Ezekiel 38-39 happen in 2012? I don't know. But, these prophetic events sure seem ready to unfold. It could be this year or the next few years to come, but I highly doubt too much longer. Bill Salus: Speaking of 2012 and the Mayan calendar, Lamb & Lion Ministries produced a "Christ in Prophecy" television program with Dr. Mark Hitchcock that I had an opportunity to watch from your site's video archives. It was an outstanding program concerning Dr. Hitchcock's book on 2012 using his understanding from the biblical perspective of the errors in 2012 being the actual end of the world. You guys had an excellent discussion on that and I would invite people to watch that episode to get more of an understanding on the prophetic significance of the year 2012, or lack thereof. In the last part of this interview on advancing the Gospel through social media, Bill and I will discuss the coming prophetic wars and speculate if the Church will be here to witness any of them firsthand. I read in an article circulated by ed hindson where harold camping "repented" for date setting... i had to laugh.... and.. i agree with rodney that this is the year.. or soooon thereafter... i cant imagine things leveling off in the middle east. Jerusalem will be the capital city during the Millennial Kingdom, so Gentiles will certainly have access to it, especially for the annual national gatherings. Susie, you may be assigned by the Lord to work in another part of the world, but then maybe He'll grant your heart's desire. A thousand years is a long time, so there will be many opportunities. i've never thought of work as something i want to do for eternity. i've had enough of work in this life. if i want to go visit with family or go out exploring the new world but i can't because now i have to go to work again?! where, exactly, can you PROVE that it says we are going to have to work in eternity? i will want to do the Lord's work, because i want to, not because i'm forced to. i don't want a job anymore. there is a difference. i want free will. i won't need money to survive so why would i want to have job? @Anonymous, Revelation 22:3 tells us that we'll serve the Lord forever, so there will be work to do, but it'll be satisfying and geared towards are given talents and abilities. For more info on what Heaven's like, check out this series on Heaven.